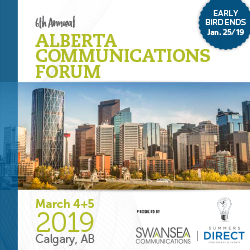 Since 2014 SummersDirect and Swansea Communications have joined forces to present the Alberta Communications Forum. Through SummersDirect’s past experience in creating relevant and engaging conferences and Swansea Communications’ current involvement in the communications field you’re sure to love the end product; an event with quality speakers, tools and techniques you can take away and use, case studies you can relate to and most of all VALUE. The Forum has secured a rate of $189+tax/night. Rooms are available to book until February 5, 2019 after this time the rate is subject to availability and cannot be guaranteed. We are an organization of professional communicators who work toward advancing careers of individual members as well as advancing the communications field as a whole. Membership with IABC/Calgary includes access to a network of over 500 local members, professional development workshops, meet-ups, webinars and more. All are welcome! We invite you to explore our site and hope the newest addition to our chapter’s membership will be you!